Cisco® OpenH264 is a codec library used for encoding/decoding of H.264/MPEG-4 AVC video streams in real time. Ths encoder option is vastly superior to default Software H.264 Encoder available in ManyCam in terms of quality and performance, for which reason we suggest using Cisco’s solution instead (as long as your hardware meets the requirements). Your hardware has to meet ManyCam System Requirements. – Open ManyCam menu, navigate to RTMP settings and select Cisco® OpenH264 under the Encoder setting. 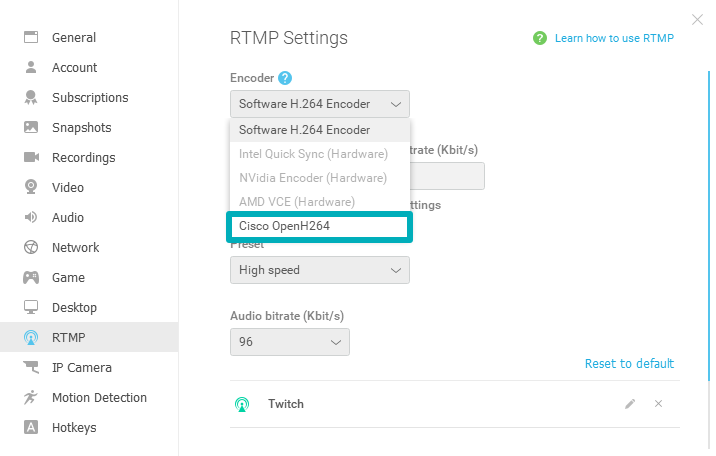 In case you need to use the Cisco® OpenH264 encoder for video recording, go to ManyCam’s Recording settings and select the encoder the same way as in RTMP.